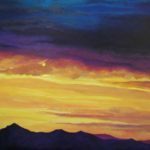 In honor of the reopening of its neighbor the Akron Art Museum, Summit Artspace Gallery is featuring a collection of stunning sky paintings by three area artists from June 29 through August 4. 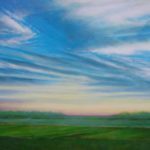 The featured sky artists are Charles Beneke, Sandra Yocum and Bill Radawec. 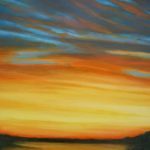 Beneke, an assistant professor at the University of Akron, will present works in oil on panel from two of his collections, “Beyond Heaven” and “A Month of Fog.” Sandra Yocum’s vibrantly colored and collaged sunsets are done with acrylics on canvas. She is from Medina, but her skies are inspired by western travels. Bill Radawec, who defines himself as a conceptual artist, is showing paintings from his collection titled “Out of the Blue,” based on contrails, the streaks of condensed water vapor or ice crystals that form in the wake of aircraft.